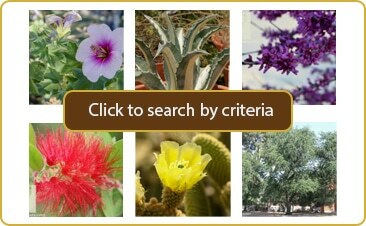 Search our Plant Catalog: over 550 plant references to choose from! The desert isn’t exactly known for spectacular fall colors, but we actually do grow quite a few plants that can give us the reds, oranges, and golds that so many of us crave this time of year. Here are Civano Nursery’s top 5 trees for fall color in the low desert. Pistache, Chinese or Red Push (Pistacia chinensis, Pistacia x ‘Red Push’) – Deciduous pistache trees give us the most reliable reds and oranges each fall. They give us some golden color as well, but most people are after the darker fall colors when they choose this tree. Its medium to large size, disease and pest resistance, and drought tolerance (once established) make it an ideal landscape tree. Ash (Fraxinus sp.) 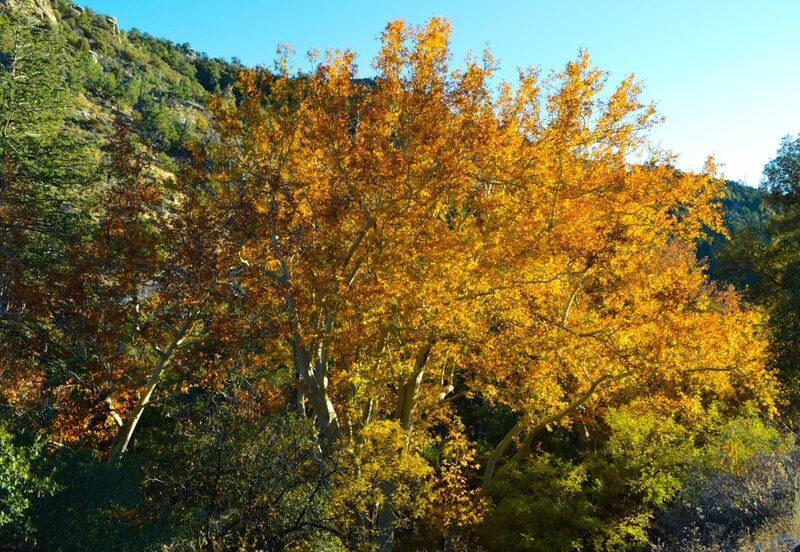 – Most ash trees have some fall color, but two varieties are stand-out performers in the low desert; Arizona ash turns a bright golden yellow, while Raywood ash is known to give more orange and burgundy colors. Ash trees tend to color up more brilliantly when fall temperatures cool slowly, and they often change colors later than other trees, but the spectacle is well worth the wait. Arizona sycamore (Platanus wrightii) – The opening photo in this post is a beautiful Arizona sycamore growing along Mt. Lemmon’s Catalina Highway. This tree’s fall color is technically a golden yellow, but the leaves also dry to a reddish brown before dropping from the branches, giving the overall impression of bright orange and yellow hues. Deciduous Fruit Trees (Malus, Prunus, and Pyrus sp.) – Apples, peaches, pears, plums, apricots and pomegranates can display some beautiful oranges and yellows in fall before they drop their leaves. It’s difficult to find trees that give us more seasonal interest than deciduous fruit trees; stunning flowers in spring, delicious fruit, and brilliant fall color make these trees winners in the landscape. Crape myrtle (Lagerstroemia indica) – This deciduous shrub or small tree can turn yellow, orange, or red when temperatures cool down in fall, depending on which cultivar is being grown. Because of its smaller stature and tolerance of pruning, crape myrtle is a great choice for patios or more confined spaces. Of course, these aren’t the only plants that give us great fall color in the low desert! Do you have a favorite that isn’t on our list? Our catalog features almost 600 different plants. Click to find the information you need to select those adapted to your environment. Give the Gift of Gardening! Is there someone special in your life who loves to watch things grow? Give them a gift that grows: a Civano Nursery Gift Card. Give us a “Like” on Facebook! NO SPAM ZONE: You can unsubscribe at any time. We won't spam you. We are a local company: your privacy and comfort matter to us.